So when's a good time to replace strings? When do they need replacing? When's the best time to replace them so they're OK to perform on them? Beginners don't want the expense of changing strings that are still doing their job. The tell-tale sign that strings have to be replaced is when the D string shows distress at fret 2, so much so that the metal winding might cut through, leaving the string unprotected and days away from snapping. The accumulation of detritus in the windings - natural greases from the fingers, hand cream, skin cells and other unpleasantries. For a performer, it's obvious when the sound has lost its punch. So how long do strings last? It's like asking how long car tyres last - with average mileage, perhaps 2 years. On a Formula 1 race car, just one race. A beginner might not care about the woolly sound - his strings will last a year. A professional might change the strings on his practice guitar more often than once a month. But surely the top strings last forever? Well, they do outlast the basses. I find that D'Addario composites can tolerate 3 sets of basses per set of tops, so the tops last 9-12 weeks and the basses 3-4 weeks. Although the top strings don't seem to degrade, the impact on the frets stresses the strings and they may stretch non-uniformly, bringing poor intonation. Top strings settle the slowest (D'Addario's composite 3rd is a notable exception). When I change strings, I do it about 12 days before a concert (a week if only the basses are changed) so that the guitar needs only one tune-up in a concert (any more is distracting for the audience). 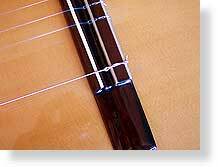 Other makes of string need different times - hago's alto guitar strings are a real nuisance, for example - the top string takes about 6 weeks to settle enough to be reliable in concert, but hago's alto players practise mostly on a prime guitar as it's less stress to the nails, so the strings stay bright for that length of time. The secret of getting strings to settle isn't magic, and it isn't overtightening them or pulling them away from the front of the guitar. It's much more simple - tune the guitar before breakfast, after breakfast, when you get in from work, after you've eaten and before you go to bed. By keeping the strings at the right tension, they settle faster. What's the best make of string? That's purely personal. I love D'Addario for their intonation and life, but I used to use Hannabach on my alto guitar. The D'Addario present a slightly cloudy treble, and there are other strings (e.g. La Bella) that have a much clearer sound, but it's at the expense of stability over temperature - some strings seem to require endless tuning. How often do strings break? Overtightening the knot at the bridge. A string breakage is a sign that something's wrong or worn-out, it's not simply bad luck.